And this Friday's Fabergé object is - a dish! Made sometime between the years 1896 and 1908. The circular dish is made of nephrite and has an everted trim. The center column is made of gold and red enamel over a guilloché ground, decorated with gold leaves that spiral up the stem. The base of the column has chased gold leaves and is set with rose-cut diamonds. 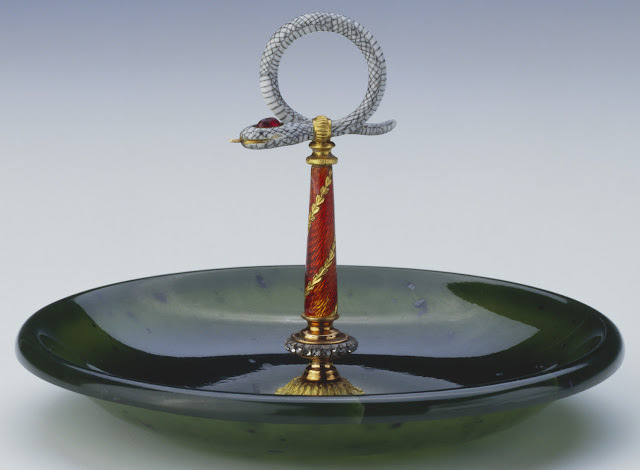 The top handle is in the form of a looped enamel snake, set with a cabochon ruby on it's head, and a gold tongue. The dimensions of the whole object are 2.4'' x 3.7 '' (6.2 x 9.5 cm), and it is part of the Royal Collection.